The US Navy helps shape lives and prepares its recruits for the future. Given the size of America, the US Navy has the most extensive fleet in the world. Therefore, US Navy officers and others representing the Navy may need to speak almost anywhere in the world; often they must make a presentation on short notice. Sometimes the site where they speak may be cramped or not designed for a presentation. A portable lectern gives them the ability to make an organized presentation almost anywhere. United States Navy officers and representatives give speeches on college campuses, submarines, ships and naval bases. Sometimes presentations are planned, but they can also be necessary in emergency situations when there is a limited time frame to prepare them. A portable lectern provides the perfect place to keep notes in these situations. At times, officers also give speeches where space is extremely limited. Storing a heavy lectern can be impractical and waste valuable space when a portable lectern or table lectern that is stable and sturdy can efficiently meet the Navy’s needs. The ProPresenter and ProLectern are small enough to conveniently fit in a confined space, yet they are light enough to move easily. The ProLectern and ProPresenter provide lightweight, portable podium options for naval presentations. The ProLectern is a free standing lectern that speakers can erect quickly and position on any floor surface. It is 22 pounds and folds into a convenient, lightweight carrying case. 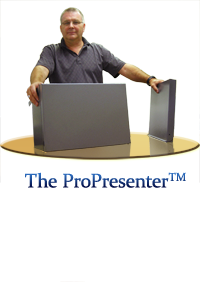 The compact ProPresenter is a table top lectern that weighs only nine pounds. Our lecterns are ideal for the US Navy because they provide quality features with convenient portability, so speaking engagements look professional no matter where they occur. 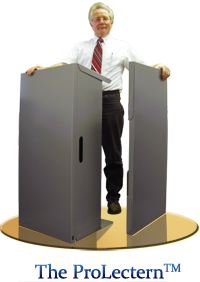 The ProLectern folds flat and multiple podiums can be stacked, so speakers can enjoy the use of a floor lectern without the inconvenience of storing a fully erected lectern that is not always utilized. Both lecterns feature a cup holder, wire media ports, and a ProjectorBoost shelf. These features help make presentations appear polished and organized. Projectors can be conveniently positioned, so speakers can use their hands to help emphasize their points instead of holding visual equipment or utilizing additional tables that take up more space. Wire media ports make it easy to add a microphone or other electronics that can help give a presentation more impact. Our lecterns also feature a ProjectorBoost shelf that makes accenting your presentation with visuals from a projector a breeze. The ProLectern also features a storage cabinet to help keep props from becoming distracting before they are used. 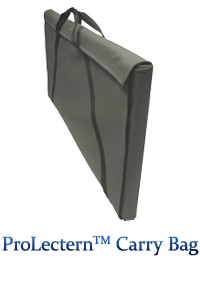 Both lecterns feature an aluminum finish that is resistant to water damage and warping. This is especially appealing for use on a submarine or ship, but it is also helpful for outdoor presentations at naval bases and other facilities. Spills wipe off with ease. The ProPresenter and ProLectern can be customized with the Navy’s logo or the squadron name of your choice. The customized logo helps promote the Navy’s brand and makes it simple to identify the Navy’s lecterns when they are transported or used in conjunction with other lecterns. The US Navy supports and protects the United States, but using our lecterns, which are made in the United States, is another way to support American industry while obtaining the quality and convenience that is essential for the US Navy’s presentations. Honoring an officer, recruiting, conducting a memorial service, presenting strategies or making other essential presentations is a breeze with affordable and convenient lecterns manufactured by ProProducts.